When I first saw Starscream in the Transformers: War for Cybertron video game a few years ago, I loved the design. I'm not a fan of the character of Starscream, but loved the way this incarnation looked and wanted to get a toy of him. They only had four molds in the toy line for the game (one was a recolor), which is almost insulting considering how good the character designs were. Thankfully, they had more toys for the Fall of Cybertron line, and Starscream is one of them. As I've said probably four times by now, I really like this look for Starscream. I'm not too crazy about his face (in both the game and the toy), but the head is excellent. He's pretty game-accurate, and is sturdy, too. He holds together really well and can stand without much effort. His head can turn, the elbows bend and the hands rotate. His shoulders and hips both rotate and swivel. The knees bend and his ankles tilt. He's not perfect though. There is a gap between his chest and back, but it's pretty hidden. Also the top of the jet is his back, so the tail is pretty obvious if viewed from behind. It's not really a problem for me, but I know there are people that aren't going to like that. Starscream's alt mode (the Cybertronian jet) looks faithful to the game. Well, it's close to what I remember it looking like in the game at least. He's a little thick for a plane, but that's what I remember him looking like in the game, so it's fine. He still looks fairly streamlined. 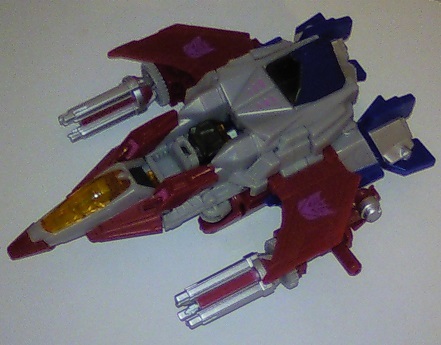 The wings, while small, fit with the compact design of the Cybertronian jet. There are peg holes on the wings and the legs (near the wing holes), so there are a few places to attach his guns, or other weapons from other figures. It's also a sturdy transformation, so he holds together really well. Now for the weapon. Conceptually, Starscream's weapon is the Neutron Assault Rifle from the game. Basically, there are two guns, each with a rotatable triple barreled gun. Each also has two different pegs, so they can be attached in multiple ways. They can be held, underslung or attached as arm guns. They can also be put together to make a gun that looks more like the one from the game. Since there are gears around the barrels, spinning one will spin the other in the opposite direction. It's a small touch, but really adds that little bit extra cool. Even though two posts are close, the gun can be held in one hand when combined. I'm a fan of versatile weapons, so I'm a fan of this one. It's really easy to use it with other Transformer figures, which makes it even better. Overall, it's a great figure. The only problem is it's availability. I managed to snag one off of Amazon for cost, since I couldn't find one in stores. 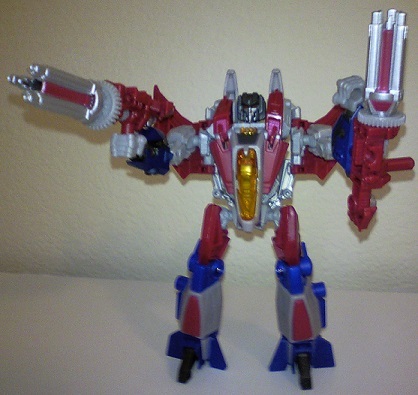 If you like the design of Fall of Cybertron Starscream, this figure should be on your shelf. It's pretty faithful to both modes from the game, he has nice articulation, and the weapon is lots of fun. Cool, I'll have to try that out.